Goals are what you want to achieve in budgeting. Do you want to have a $5,000 savings within one year? Get rid of all your debt in three months? Or just have your income and expenses balance out? Goals should have a time-frame or a deadline. They should also be specific and can be quantified (put numbers). Also, goals can be short-term, medium-term or long-term. Short-term budgeting goals are those that you want to achieve as soon as next week to next month. An example of this would be to earn enough (specify amount in dollars) for an inexpensive vacation or to afford a small home theater within one month. Medium term goals are those you aim to achieve within one year. An example would be to earn enough (again, specify amount) for a down payment for a house or a car in 12 months. Long term goal in five years or longer, like being able to pay off your mortgage in 10 years, or to retire in 20 years. When determining your long-term goal, take into consideration the rate of inflation. The amount you need to retire on in 20 years may be 100% more compared to the amount today. After determining your specific goal, the next step is to determine your current financial situation – what you are worth in terms of money. You have to know where you are before you know which direction you have to go to accomplish your budgeting goal. 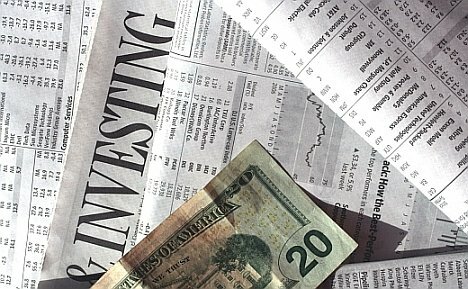 Your financial worth is comprised of your savings and other assets. Savings include all your money in the bank, certificate of deposits and other assets that you can easily turn into cash. Other assets are holdings that are not easily turned into cash, that is, things that you have to sell, like jewelry, real estate or your used TV. If you know what you are worth, you will know how close you are to your goal and/or how much you have to make effort to reach your goal. Your income includes your temporary, part-time, seasonal income and “found money”. List down all your spending. 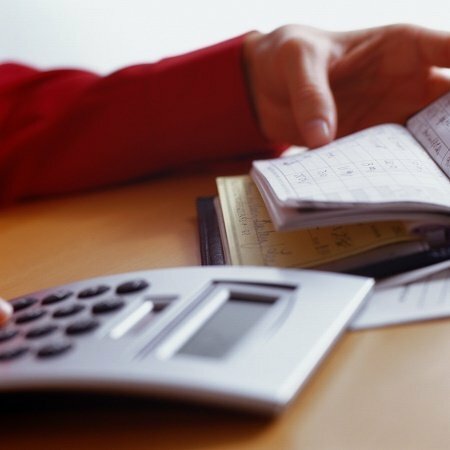 Your spending diary will help you create your budgeting spreadsheet. In the process you will also recognize and be aware of all your expenses and you will able to see clearly where your money goes. This step might reveal to you that you are spending a lot on unnecessary items. After a month, collect all the data from your spending diary. Categorize your spending into “Musts” and “Optional”. 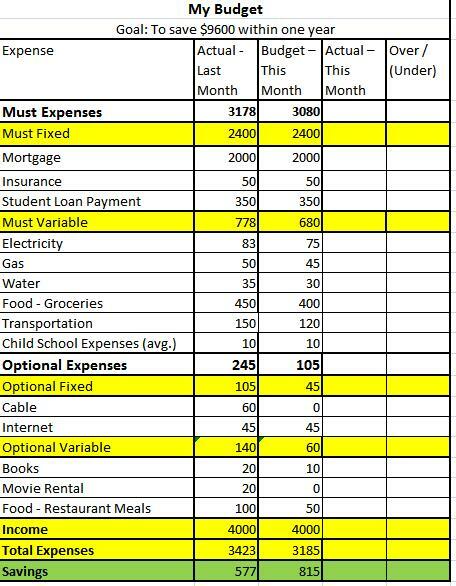 “Must” are spending that are required each month. These are expenses that you cannot really do without – essential for survival, comfort or earning an income. “Must Fixed” expenses are those that do not change in dollar value. Examples are rent or mortgage payment, insurance, or student loan payment. “Must Variable” expenses are those that change in cost from month to month. These are expenses that you can save on like food, water, and electricity. “Optional” expenses are those you CAN live without. 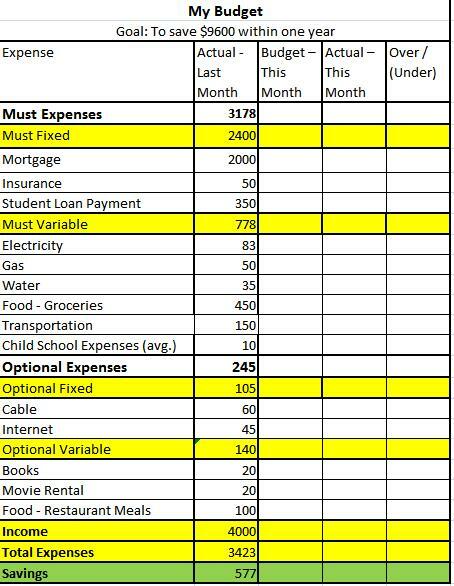 These are also expenses that can be postponed when expenses exceed income or when your budgeting goal allows for it. Examples are books, cable, the internet, restaurant meals and movies. You can always decide not to have any “optional expenses”, and this will not threaten your survival. “Optional” expenses can also be categorized into “Fixed” and “Variable”. “Optional Fixed” expenses are those that do not change in dollar value. Examples are cable TV and internet subscription. “Optional variable” expenses are those that varies from month to month like restaurant dining and vacation expenses. You can pro-rate or distribute your average cost equally per month for some variable expenses. Identifying variable expenses in your budget enables you to identify expenses that you can save on. Sometimes, you have to use past 4 to 6 months of average to estimate how much you spend on each category. Use your banking and credit card records. See this list of personal budget items for budget category ideas. 6. Create a budget spreadsheet. In this example, your goal is to save $9,600 in a year, or $800 a month. Your actual savings, however, for this month is only $577. Therefore, you have to find a way to save $233 or find additional income for that amount. In your budget this month, you are aiming for $815 savings. According to your budget spreadsheet, this can be done by saving on the “Must Variable” items like saving on electricity, gas, water, groceries and transportation. You also have to cut the “Optional Fixed” cost of cable T.V. You also have to forgo “optional variable” costs like movie rental and cut your spending on books and restaurant meals in half. This month, you record again how you spend and compare it to your budget. After the month, you fill in your actual cost in the “Actual-This Month” column. You discover that your actual savings in $813 which is $2 short of your $815 target. If you are still intent to pursue your goal, you have to target $817 the following month on your budget ($815 target savings + $2 to make up for the shortfall this month). You can analyze where you fell short by doing the over / (under) column where you deduct the budget vs. your actual. In this example, you actually overspent for electricity by $5, although you partly made up for it by saving $3 on gas. Your income should equal expenses plus savings. 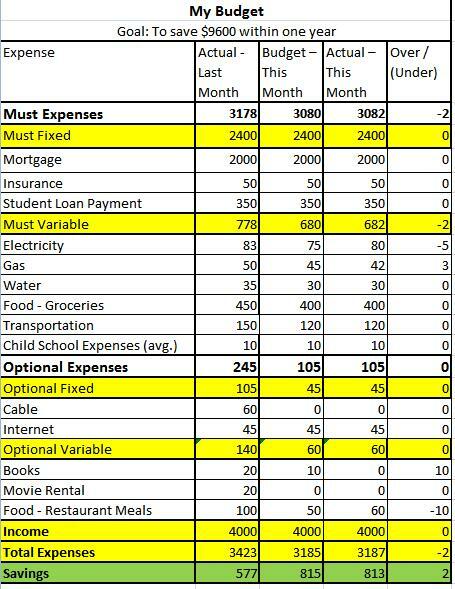 If your expenses are more than your income, you have to cut back on non-essential expenses. If necessary, you may even have to cut back on variable essential expenses like food and utilities. You may even need to take drastic measures like move from an apartment you cannot afford, take public transportation, kick habits that you are used to, or sell stuff. Discipline yourself to stick to your budget. Always have your goal in mind to stay motivated. Pay yourself first – put your money in savings program that meet your goals. Recognize what type of spender you are so you can change your habit and come up with realistic budget you can stick to. Revise your budget to reflect your changing financial conditions. If you have a problem area in your budget, focus on solving it. thanks so much for the tips that ihope to apply on myextravagant life style.